"I've done so many things in show business but people say, 'You were in The Wizard of Oz?' It takes people's breath away." 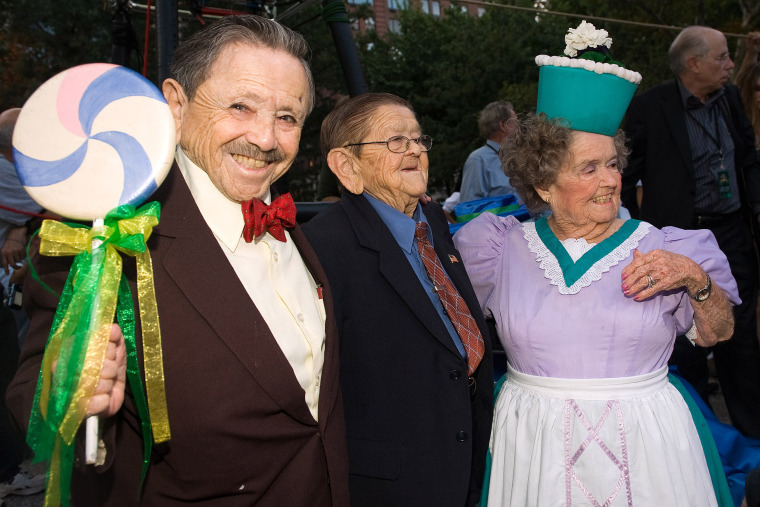 LOS ANGELES — Jerry Maren, the last surviving munchkin from the classic 1939 film "The Wizard of Oz" and the one who famously welcomed Dorothy to Munchkin Land, has died at age 99. Maren died May 24 at a San Diego nursing home, his niece, Stacy Michelle Barrington, told The Associated Press on Wednesday. In an entertainment career that spanned more than 70 years, he portrayed The Hamburglar and Mayor McCheese in McDonald's commercials, appeared in scores of films and TV shows and made personal appearances as Little Oscar for Oscar Mayer hot dogs. But it was his role as one of the Lollipop Kids in "The Wizard of Oz" that always held a special place in his heart. He would show up regularly at film conventions, munchkin gatherings and other events honoring the cast over the years. "I've done so many things in show business but people say, 'You were in The Wizard of Oz?' It takes people's breath away," he told writer Paul Zollo during a 2011 interview for the publication North Hollywood Patch. "But then I realized," he added, "Geez, it must have been a hell of a picture, because everyone remembers it everywhere I go." Maren, who stood just 4-feet-3, was one of more than 100 little people recruited to play munchkins in the movie. He stood out from almost all the others, however, as the "Lollipop Kid" who sang and danced his way to front and center before the film's star, Judy Garland as Dorothy, and then, with a flourish, handed her an oversized lollipop. Maren said he ad-libbed that lollipop handoff in an early take and the director liked it so much he told him to keep doing it. Just before the presentation he danced between two other Lollipop Kids as they moved toward Garland singing, "We represent the Lollipop Guild, the Lollipop Guild, the Lollipop Guild. And in the name of the Lollipop Guild, we wish to welcome you to Munchkin Land." More than half a century later he'd adlib the song's lyrics, concluding, "We wish to welcome you to Smithsonian Institute," as he helped lead the unveiling of a 2006 exhibition of the movie's memorabilia at Washington's Smithsonian Institution. "He was a very sweet person and he was very approachable if you were a fan," his niece said Wednesday. "He was the kind of person who would always take time to talk to you." Born Gerald Marenghi in Boston on Jan. 24, 1919, Maren was singing and dancing at a show at a Connecticut hotel in 1938 when MGM talent scouts saw the diminutive teenager actor and invited him to Hollywood to join the munchkin cast. Having dreamed since childhood of a being a Hollywood film actor, he jumped at the chance. He would later recall being paid $50 a week for the role, twice what his father was making. He'd go on to appear in dozens of other films, TV show and commercials. Among them was another film classic in its own right, "The Terror of Tiny Town," a traditional Western but with a little people cast. Other films included "Under the Rainbow," the 1981 sendup of the making of "The Wizard of Oz," and "Hello, Dolly!" He appeared on TV in episodes of "Seinfeld," ''The Twilight Zone," ''The Beverly Hillbillies," ''Bewitched," ''The Wild Wild West," ''Mary Hartman, Mary Hartman," ''Lou Grant" and "Julia," among others. But Maren's connection to "The Wizard of Oz" never faded. He attended munchkin reunion gatherings frequently, and with the 2014 death of fellow munchkin Ruth Robinson Duccini he became the group's final survivor. In 2007 he and other munchkins attended the unveiling of a star on the Hollywood Walk of Fame honoring them. In 2013 he placed his handprints in cement outside Hollywood's Chinese Theatre to promote the release of a 3-D version of "The Wizard of Oz." "It means everything to me," he said at the time. "It shows that it could happen to any one of us, you know, if you get lucky breaks." Maren was preceded in death by his wife, Elizabeth Maren. The couple had no children.